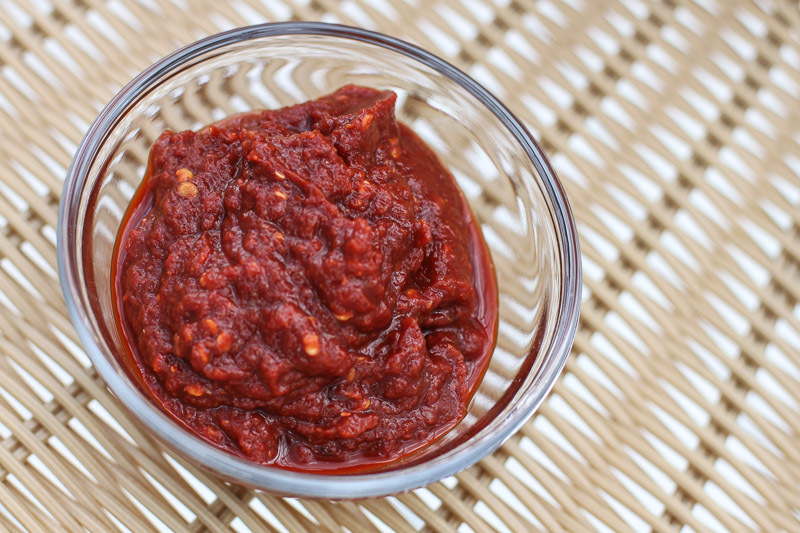 Fermented hot sauce made with chipotle peppers. 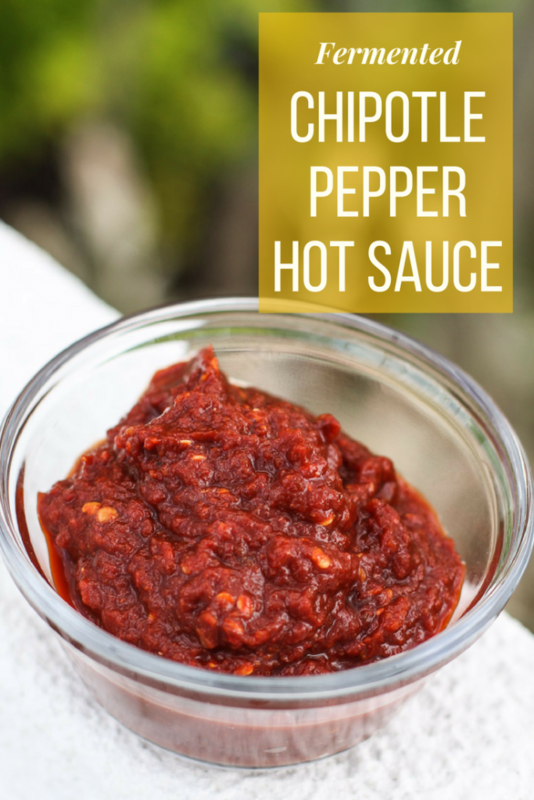 Smoky, spicy and so good! When I first started fermenting food and drinks at home, I was most excited about developing my own fermented hot sauce recipe. Matt loves to add hot sauce to just about everything and I love it on most things, so I knew this would be something we would be reaching for on a daily basis. 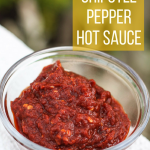 This fermented chipotle pepper hot sauce gives a spicy and smoky flavor that really enhances a lot of different dishes. Of course, it’s a must-have for Mexican night, but there are so many other ways to use it. Try it on your eggs, in your Bloody Mary or add it to a homemade salad dressing recipe for some extra flavor and heat! First, dissolve the sea salt into the filtered water to make a brine and set aside. Then, chop the onion, garlic and dehydrated chipotle peppers. 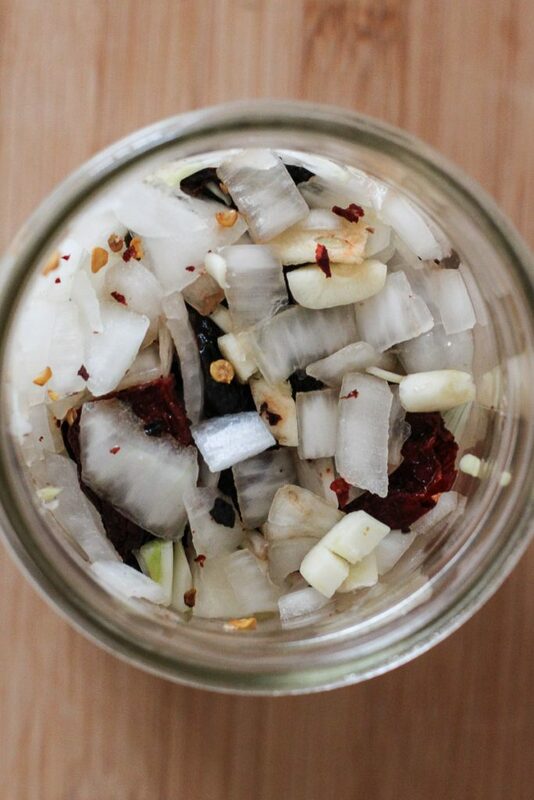 Next, add the onion, garlic and dehydrated chipotle peppers to a small glass jar. 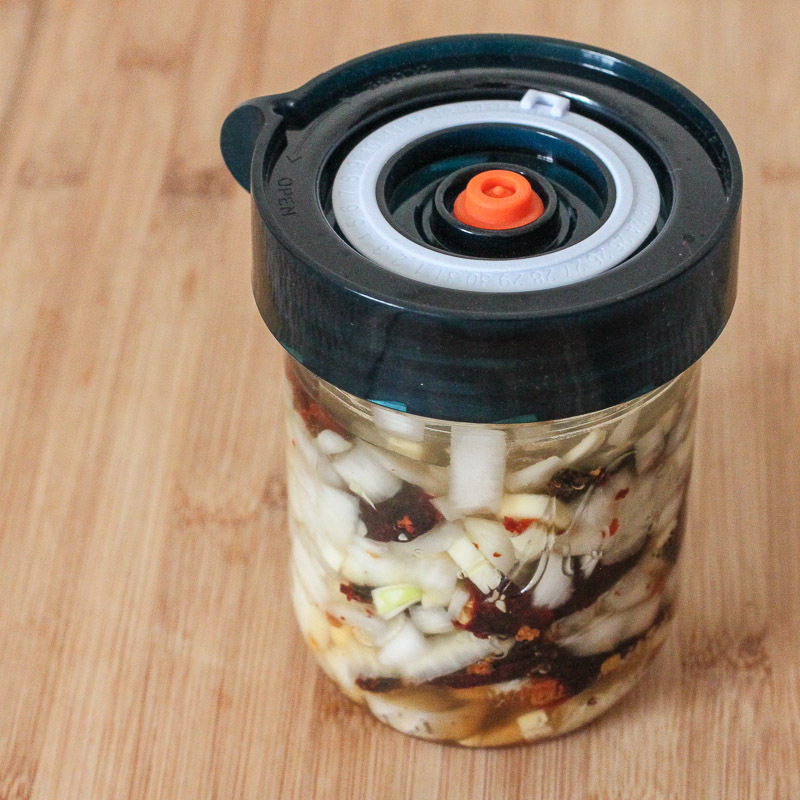 Pack the ingredients down to eliminate any air pockets and to encourage the onions to release their juices a bit. Pour the salt water brine in the jar to completely submerge everything. Top with a glass fermentation weight to ensure everything stays under the brine during the fermentation process. I just started using The Easy Weights from Nourished Essentials and they work perfectly for this recipe. 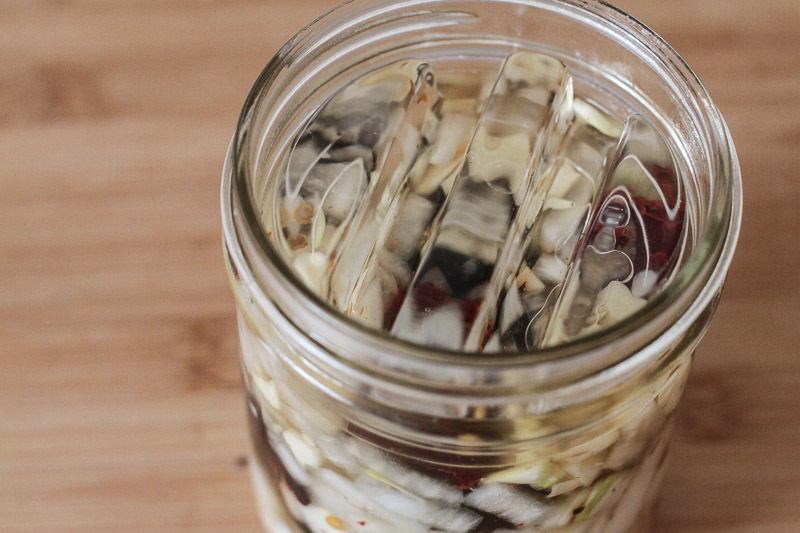 Put an airlock or lid on your jar and allow to ferment at room temperature for at least 21 days. Many people let their hot sauces and salsas ferment for many months, feel free to experiment. I recommend at least 21 days, as it will give your mixture enough time to develop some amazing flavor! After 21 days, drain out excess brine and reserve. Process everything else in a food processor. 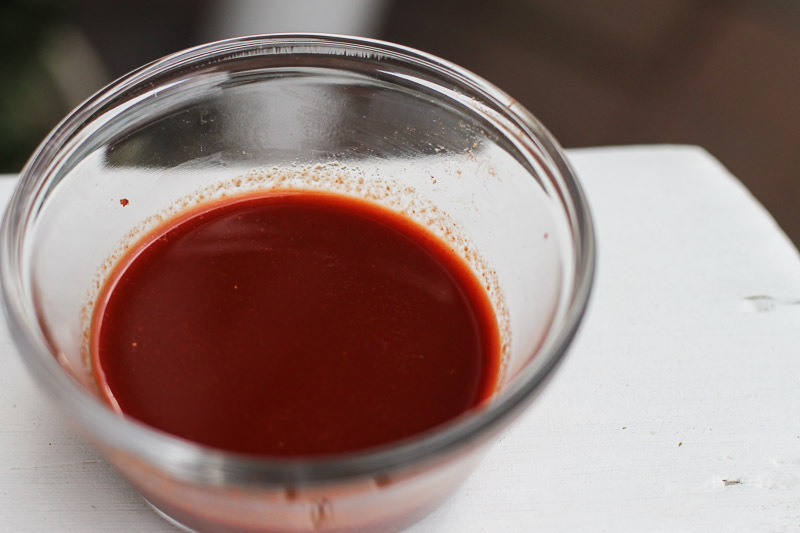 Then add the brine back in until the chipotle hot sauce reaches your desired consistency. If you prefer a very thin sauce (similar to Tabasco) you can push your final product through a fine mesh sieve. The parts that don’t make it through the sieve can be used a lot of different ways. I like to add some to a salsa I already have on hand or mix it with with peppers and onions for a stir fry. Make it in to a Tabasco style! I know I’m late to the party, but I was able to procure some smoked Serrano peppers and I’m going to try a batch with that.